Sharon's favorite dog to groom is the shih-tzu. Jen came to work at J&J in 1996, she has worked both full and part time for almost 20 years. Jen graduated from The Animal Arts Academy in 1995. Her favorite groom dog is the poodle. Mr. Lippit is the shop cat, he joined the team in 2014. He was adopted from reTails rescue. He can be found lounging in the reception area, napping, most days. Sharon and Jen bring their own dogs, Astrid the rainbow colored poodle, Fizzy and Shu-shu the pekingese, and Harry and Zena the chihuahuas to work with them each day. You can meet the whole gang anytime at J&J Grooming. 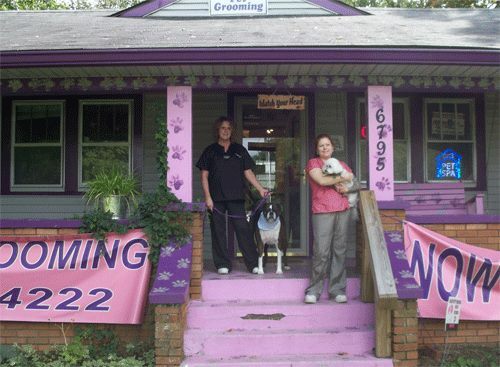 At J&J Grooming, we are here for the Dogs! We have over 50 Years of combined Grooming Experience. We hand scissor for the "Best" cut for your Dog. We have been Serving Speedway and the West side of Indianapolis for over 20 years.